Opened on December 17th, 1999, The Brogue Irish Pub is one of the most popular and revered restaurants in Mississauga. 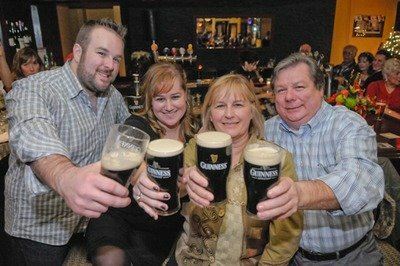 Proudly owned by the Donnelly family, this restaurant prides itself on unmatched customer service, expertly prepared food, the perfect pint of Guinness, all in a warm, inviting atmosphere. Located in the heart of Port Credit at Hurontario and Lakeshore, The Brogue is a signature part of our city that’s definitely worth a visit or few. Delicious steaks, seafood, fish and chips, chicken curry are among customer favourites. Yes, this longstanding pub is the go-to place for pub fare, including wings, burgers, fries, etc. but they’re able to cater to nearly any palate, age group and to changing food trends and allergies. If you’re looking for the perfect pint of Guinness in Mississauga, The Brogue is the best place to get it. Additionally, all the beer they have on tap and wines are high quality and their cocktails are expertly made. The Brogue believes that anyone can pour a drink but it takes an exceptional staff to serve a drink, which they certainly have. A comfortable and friendly place to meet and where you can enjoy great food and drink amongst great people. 230 with the ability to host private functions in separate rooms. Classic Irish fare and expertly made comfort food. Top level customer service without exception, delicious food made with care, in a clean, warm and friendly environment. Chef Freddy, who’s been part of The Brogue family for nearly a decade, is extremely well seasoned, having worked on cruise ships, hotels and many notable Mississauga restaurants. He’s got a tremendous vision for food creation and is often creating new dishes. Having a longstanding friendship with Tommy, The Brogue was somewhere Chef Freddy wanted to work and when the opportunity arose, they decided it was the best move forward and haven’t looked back since. He also teaches his craft at George Brown College and is extremely passionate about food, the knowledge surrounding the food industry and he’s an expert in the butchering and seafood trade. The impressive aspect to him is that he sees his profession as constantly evolving and actively takes every opportunity to expand his knowledge of the culinary world. Mid-range price for high quality, delicious food. If you’re hungry or thirsty for well-made and great tasting food and drink, The Brogue Irish Pub has a seat ready for you.